This sculpture from India combines two Hindu deities in a single being, called Harihara. 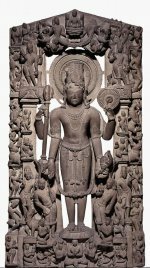 The four-armed figure is the composite form of the gods Shiva and Vishnu. The right side represents Shiva and the left side Vishnu. The background figures on the right are associated with Shiva and include his sons Ganesha and Kartikeya. The figures on the left side and on top of the stele are Vishnu’s ten incarnations. Shiva’s hair is in an elaborate coif adorned with a serpent and skull, and he holds a rosary and a trident symbolic of his power and ascetic nature. In keeping with his regal role as the preserver of order in the universe, Vishnu wears a tall kingly crown. In his ear he wears an elaborate earring and he holds his attributes of the conch and wheel. Sculptures such as this would have been placed in a niche in a temple wall. From Khajuraho, Madhya Pradesh, central India, X century AD.